Geographical protection to just "black" Darjeeling tea and not to the "green" and "white" varieties is hurting the entire supply chain - from the gardens to the importers in overseas countries. 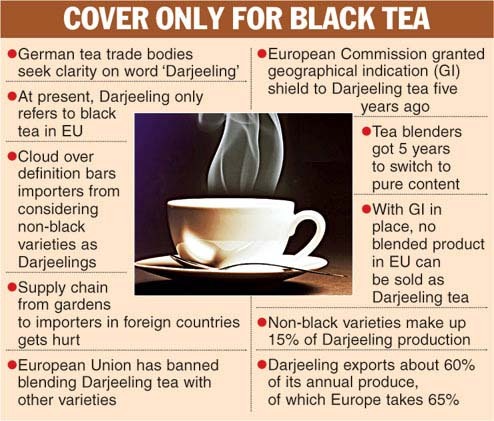 German tea trade bodies have urged the Tea Board to clarify the word "Darjeeling" in the current PGI (protected geographical indication) tag. 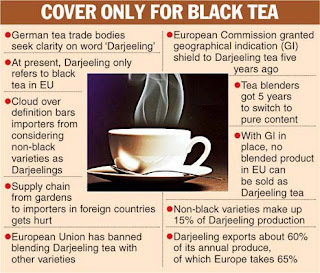 In the European Union (EU), "Darjeeling" only refers to black tea, barring it from importing the non-black varieties such as white and green from the region. "There is a need to clarify the position of green and white Darjeeling tea as their status remains unclear within the current PGI. Please confirm if the aforementioned PGI is being extended to include these types of manufacture? Without such an extension, the word 'Darjeeling' in the EU will only define black tea from this region," Nicholas Revett, president of Tea and Herbal Infusions Europe, wrote in a letter to Tea Board deputy chairman Santosh Sarangi. The German Tea Association has seconded the letter. Non-black varieties make up 15 per cent of Darjeeling production. The WTO's agreement on Trade-Related Aspects of Intellectual Property Rights protects the quality, reputation or other characteristics of products that can be attributed to their geographic origin. A geographical indication (GI) not only indicates where a product is made but also identifies its special characteristics. GI is generally protected in perpetuity. The EU's ban on blending Darjeeling tea with other varieties came into effect from November 10 this year. However, the European Commission, the EU's executive arm, had given Darjeeling tea a GI shield five years ago on November 10, 2011. Nevertheless, blenders were given five years to switch to pure content, which meant they could mix 51 per cent Darjeeling tea and 49 per cent other variety and sell it as "Darjeeling" tea till November 10. Now with GI in place, no blended product in the EU can be sold as Darjeeling tea. The letter further said: "Indian producers will no longer be able to sell green- and white-labelled Darjeeling tea from November 11, 2016. This will have a negative impact on all parties in the supply chain. This matter has been raised before but without legal clarification there will almost certainly be confusion and a commercial hiatus. We will be grateful for your prompt intervention to resolve this matter." "The harvest season for this year is over. Our exports have not taken much of a hit but the real effect will be felt next year if the GI rules are not amended," said a leading Darjeeling tea exporter. "We have started taking initiatives to make a fresh applications to the GI registry, which is under the department of industrial policy and promotion, to add non-black Darjeeling varieties. The documentation of green, white and other varieties are under process and we will file it by early next year," Sarangi told The Telegraph. Total Darjeeling yields till October have been 7.56 million kg against 8.76 million kg for the whole of last year.